Paul Krugman wrote in August 2002 that in order to deal with the aftermath of 9/11 and the collapse of the stock market bubble, Greenspan and the Bush administration needed to do stuff to create a housing bubble in order to stimulate demand based on home equity loans. He wasn’t optimistic that such a bubble could be created only a few months after writing, but felt it should be done. Well, here we are at the end of the housing bubble. 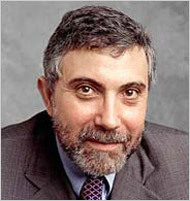 Dagnabbit, Krugman! Don’t you remember what happens at the end of an economic bubble? BAD THINGS. Lots of people in 2002/2003 were predicting a double-dip recession. In those double-dippers, the second dip is typically worse than the first. It looked like the USA dodged that bullet for a while, but I’d always been waiting for the other shoe to drop. It started to fall in 2007 and kept falling all through 2008. I think it’s rolling around on the floor right now… anyway, welcome to the second dip of that 2001 recession. It’s worse than the first one, and that worseness is sharpened by the unwinding of the artificial constructs designed to fend it off in the first place. In avoiding a deeper recession, we risked collapse of our banking and financial sector – and it’s still not out of the woods just yet. The French economy was a ruin in the wake of its involvement in the War of the American Revolution. In order to work through its troubles, the government had to borrow more money. No problem, right? Wrong. Over 100 years of overspending on luxuries and wars meant France was maxed-out. No creditor wanted to lend anything to a nation that could not afford its commitments and make interest payments. The only solution was for the French to raise taxes in order to be able to make payment on more loans along with meeting its obligations. The idea was pretty straightforward: raise taxes, take out more loans, sort out the public finance mess, then start paying down the debts. It ran into a bit of a snag when, in order to raise taxes, the king had to convoke the Estates-General, which promptly made itself the supreme authority in the land. But that’s for another story… economically, I want to go back to that creditor part: France could not borrow more money without raising taxes. The US’ debts are increasing to the point where we may be faced with such a situation. Moreover, EVERY nation in the world is trying to borrow money to finance massive amounts of public tick. What do we do when there’s not enough money being lent? Our interest rates are next to zero right now. If we raise them, the government could borrow more money at the cost of strangling growth in business investment and personal consumption spending. If the government instead chooses to just print money, most folks holler about the specter of hyperinflation. Set that aside for moment. Right now, most folks are saving money – and the first step of saving is paying off debts. Paying off debts destroys money, and that’s a deflationary pressure. If we should have deflation, that’s even more incentive to pay off debts today rather than tomorrow: today’s money is less dear than tomorrow’s in deflation. The Emperors all have fancy degrees and Nobel prizes to spare: so far, basic Economics has been the child pointing out how very little they have on. The market paradigm did not shift in the 1990’s with the “Internet Economy” and neither did it shift in the 2000’s with the seemingly-eternal increase in housing prices. Those were bubbles, and they popped. Now there’s a call for massive spending: where’s the money going to come from and how will we be able to afford to borrow it? I’m sorry, Mr. Krugman. Your solution to the earlier recession was bad enough: I don’t think your solution to this one is going to be any better. This entry was posted in Economics on 07/31/2009 by deanwebb. Sure, Honduran president Zelaya is out of a job, thanks to a military coup. But did you know why? Seems as though he betrayed his big business buddies to become a Chavezite populist. He tried to change the constitution to lengthen his stay in office. That’s when the Honduran Congress moved to impeach him. The army jumped the gun and launched a coup before the impeachment could take hold. Now Honduras is in a real mess, government-wise. Who does Obama’s administration support? Zelaya. OK, so he was the rightfully elected president… but he was also subverting the constitution… The usual argument in such cases is that the president is “friendly to US interests in the region,” but he wasn’t even that. So if we help restore democracy in Honduras, does that mean we have to find a different guy to be president there, one that won’t try to subvert the constitution or install a military dictatorship? For the record, the elections for later this year are still on. Congress has appointed an interim president, as it’s supposed to do during an impeachment. Sure, Honduras is riddled with corruption at all levels… Zelaya’s probably no better than anyone else climbing the slippery pole of politics over there. If he’s reinstated, look for another coup to happen again, possibly one that kills him. If he’s not reinstated, look for a populist opposition to gain strength against the monied elites of Honduras. Politics have been polarizing in Central and South America, with the sensible folks in the middle having less and less voice as the radicals on the right and left hijack the political processes. This entry was posted in World Hellhole Report on 07/30/2009 by deanwebb. I don’t like cursing the darkness without lighting a candle, so how about a reason to live? 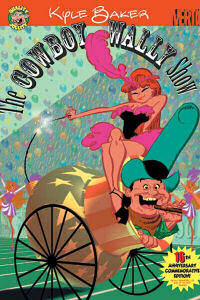 Let’s start with Kyle Baker’s breakout work, The Cowboy Wally Show. I’d seen it on the comic store shelves for a while and finally broke down and bought it one fine day. Oh, the joy I had! Baker promises quality jollity on his covers, and he certainly delivered with this one. The Cowboy Wally Show is written in a cinema verite style. Before you look at me funny for my saying I really enjoy Baker’s cinematography in this book, you have to understand it’s told as a filmed documentary for most of the book, with other parts dedicated to Wally’s television and film appearances. The book is hilarious. Baker’s drawing style is reminiscent of the golden age of Mad Magazine, with a great debt to Wally Wood, by way of George Woodbridge. He’s realistic most of the time, but always ready to exaggerate facial expressions for grand comic effect. Baker’s writing is up to the greatness of his illustration. It’s got one of my favorite lines ever: “We’re in a fort. Lock the door.” The story swings and plunges and rockets in three dimensions, taking its characters with it. OK, there are a couple of cardboard guys tossed in for running gags, but Baker definitely paints a picture of Cowboy Wally as a consummate idiot done good. The closing set, “Cowboy Wally’s Late Night Celebrity Showdown” is a perfect romp that I love to re-read. If you’re into graphic novels, you must own this one. If you’re not yet into them, start here. There are things comics can do that simply can’t be done in any other medium. Baker’s a great artist and writer and this is a great introduction to the rest of his work. You can find it at your local comics store, which is the best place to get your comics. If you have no local comics store, then… sigh… order it from Amazon. This entry was posted in Reason to Live on 07/30/2009 by deanwebb. This article reads like something out of the old SimCity2000 game… The Uzbek government agencies are basically shaking down local businesses whenever their budgets come up short. Don’t these guys realize that’s a Keynesian no-no? The shakedown money acts as a curb on further business investment, which in turn prevents aggregate supply from increasing. Sheesh! Moreover, the government of Uzbekistan is also taking automatic withholding for utility payments out of paychecks. We’re talking 30% of those paychecks. The money isn’t even for current usage: the withholding includes payments for possible future bills. Translation: there’s another skim going on here. The government’s short on cash and is deliberately trying to reduce the money supply. This will also eventually lead to a drop in investment, which will cut aggregate supply. Tsk tsk tsk. Also, the banking sector in Uzbekistan is about to collapse. The government, which as I pointed out above is cashless, will not be able to bail it out. This, as well, does not bode well for that AS curve. OK, so an increase in the AS curve is probably NOT what the Uzbek small business owners are thinking about. They’re just cheesed that they have to shell out the dough in the first place. Kind of like small business owners in the US over Obama’s proposed tax scheme. However, there are some key differences between Obama and Uzbek’s CEO, Islam Karimov. Islam Karimov boils his political enemies alive and orders security forces to open fire on crowds of demonstrators. Obama deals with political foes by cocking his head to one side and saying “hope” until the debate’s over. Big difference in style, there. Obama actually also got elected in a for-reals election where people were free to vote for his opponents without fear of reprisal. Karimov, on the other hand, is the guy that put both “fear” and “reprisal” into “fear of reprisal.” Karimov’s government recently held a three-day conference to trumpet the great human rights reforms they’ve made in Uzbekistan – which of course means there never were any reforms. Karimov also pushed through election reforms: now any party is free to run for office, so long as it does not oppose his party. You can always tell how tyrannical a dictator is by getting the inverse of how often he travels abroad. The bigger the tyrant and more desperate his grip on power, the less he travels. Karimov’s made 2 trips in the last 4 years. Obama, by comparison, has been all over the place and he’s only just started. How bad is it in Uzbekistan? How about compulsory child labor? Students are bused out to fields to pick cotton. These kids are as young as 8 or 9. They make good money, five dollars a day. Er, uh, um… OK, that’s terrible money. I know that “technically” it’s not slavery if you pay the workers, but come on. It’s compulsory labor and throwing tiny amounts money at it doesn’t make it not slavery. So, yeah… child slavery in Uzbekistan. That’s how it becomes worthy of inclusion in my World Hellhole Report. It’s so bad in Uzbekistan, that they have to jail poets. Here we just turn ’em loose on MySpace. There, it’s another story. Who knew rhyming was an act of terror? And, yes, that’s how they justify jailing poets. It’s part of the War on Terror. Those three words have given a lot of really nasty governments a handy catchphrase to use when inflicting state-sponsored terror on their people. Uzbekistan can claim one recent redemption: it’s no longer on Transparency International’s Global Corruption Barometer. No, the Uzbeks didn’t bribe the bribery watchdog group. Rather, they simply pulled a North Korea and stopped all information from leaving the country. I should note that last year, Uzbekistan was one of the 20 Most Corrupt Nations, so one can see why they would rather have no ranking than a bad one. So why does the USA tolerate all this garbage in Central Asia? Simple. We need the airbases there. Thanks to a South Korean front, we’re able to fly NATO freight from an Uzbek airport. The USA got kicked out of Uzbekistan and banned from their airspace when we criticized Karimov for boiling his rivals and opening fire on crowds of demonstrators. Now that Obama wants to get more involved in Afghanistan, we’re not making a peep about Karimov and his hijinx. Truth be told, Bush’s administration didn’t make a peep, either, until international pressure forced him to peep in 2005. It’s nice to know we can all let bygones be bygones in order to accommodate the demands of realpolitik. I expect we’ll see a huge increase in US heroin consumption before long. This entry was posted in Economics, World Hellhole Report on 07/30/2009 by deanwebb. It deals with more than routine traffic stops and – WARNING: ILLEGAL DRUG USE DEPICTED. Therefore, this isn’t required viewing for any of my students who object to such depictions or whose parents object to such depictions. Be that as it may, this is America, and we still have rights of free speech when discussing our rights. If anyone wants to make the headline, “Teacher Fired for Discussing Civil Rights,” be my guest. Have mercy on me, but that does sound like a juicy headline, possibly with some suspension with pay for me and a termination settlement of an undisclosed amount. At any rate, this is a discussion of the 4th, 5th, and 6th Amendments to the Constitution. When we talk about fighting for freedom, these are several of those freedoms we fight for. I know the kids in the videos are guilty, guilty, guilty (maybe not the second kid, but he may have been). So what? We have rights to defend ourselves against an excess of executive power. If there is cause for a search, it should be articulated by the officer in question. We do not have to testify against ourselves, and it’s tricky how we can waive that right by confessing to breaking a law. And no deal an officer can give us will ever be as good as what a lawyer can work out. In light of the Gates affair, we all need to take some time to reflect on our rights and how to express them – and how not to express them. NEVER get angry with a police officer. Don’t even raise your voice or get snarky. Same with a teacher, private security guy, TSA screener, or ANY authority figure. That’s just inviting tough times to befall you. Gates shot his mouth off when he dealt with the officers. When the blues are in your living room responding to a possible breaking and entering 911 call, it’s not a good time to discuss racial profiling, let alone in a harsh or excited tone. The thing with racial profiling – which may have also been a factor in the second incident in the video – is that if the officer isn’t using racial slurs it’s almost impossible to prove. It’s much more easy to prove a search was without consent, for example. As a teacher, I’ve been accused of being a racist by kids trying to get out of trouble and that only makes me madder. That leads to an escalation of the situation. It’s the same with police, and it’s why the video presenter makes such a strong point about being polite to whoever’s stopping you. By the way, on the racist thing… when I point out that there are plenty of students of all makes and models in my classes that don’t get into trouble, the kid that’s calling me racist then accuses the other kids not in trouble of “acting white.” Way to stay classy, kid accusing me of racism. Some of the officers portrayed here were aggressive in their tone. In my experience in dealing with police, that’s more the exception than the rule. However, they do exist, as do outright bad cops. If a police officer is already in a bad mood, verbal or physical escalation is not going to improve the situation. Running is the worst thing to do: it’s the universal admission of guilt. To paraphrase Chris Rock, if you run, the police are going to bring a beating with them. As for the kids in the incidents… they really wouldn’t have had anything to hide if they weren’t doing anything illegal. In the second take on the third incident, the party host had to police her own party and be a bit of a jerk to the guy that wanted to use marijuana. Self-policing is an important thing to do. But even if the kids weren’t doing anything wrong, a really bad cop could have chosen to plant contraband on the scene and make an arrest from it. It’s happened before, and that’s why even if you have nothing to hide you need to assert your rights. Moreover, if you’re following the law – not speeding and keeping the party noise down – the police typically won’t even get involved. This entry was posted in US Government on 07/30/2009 by deanwebb. A basic tenet of Keynesian Economics is that, in times of recession, governments should cut taxes and/or increase deficit spending. The US government is doing just that right now. However, and you knew there had to be a however for this to be a story, most state governments have to balance their budgets. In these hard times, that means they have to raise taxes and/or decrease overall spending. That means the requirements of their state budgets are working to cancel out federal fiscal stimuli. While we’re on the subject, Keynes held that imports are a drain on GDP. When imports decrease, that shows up as a GDP increase, even though it may be indicative of a deeper economic problem, such as a collapse of demand in a nation. GDP in the USA can go higher in the recession due to this and fiscal policies and the economy can still be in the toilet. So if a talking head on the news should start bubbling about an increase in GDP for a quarter, look carefully at how much of that was due to a collapse in demand for foreign goods and unsustainable government overspending. This entry was posted in Economics on 07/29/2009 by deanwebb. This entry was posted in World Hellhole Report on 07/29/2009 by deanwebb. Simon Johnson’s testimony to the House Committee on Financial Services. This is a must-read for anyone and everyone. I’ll preface it with a few comments. First off, yes a free market is best for handling just about everything. However, when players in a market collude with government to change said market so that it is no longer free… when players in a market take steps to perform actions that are injurious to their customers… that’s a market failure. We have one such in the USA in our banking and financial services industries and this article describes the interplay of the market and government and how it resulted in the mess we’re in. What do we need to do to get out of this mess? Mr. Johnson details some steps to follow, but it’s up to Congress to accept or reject them. My guess is that if we don’t have some political courage in our Congressional leadership, we’ll see them rejected, with the ominous consequences to follow later. This entry was posted in Economics, US Government on 07/29/2009 by deanwebb. With the new webhost, it’s about time I got a new blog system. Hello, WordPress. This thing’s got features. This entry was posted in Ze Rest of Ze Ztuffm on 07/28/2009 by deanwebb.